It’s not easy being an official –, particularly for younger players. Many quit after only a short time. 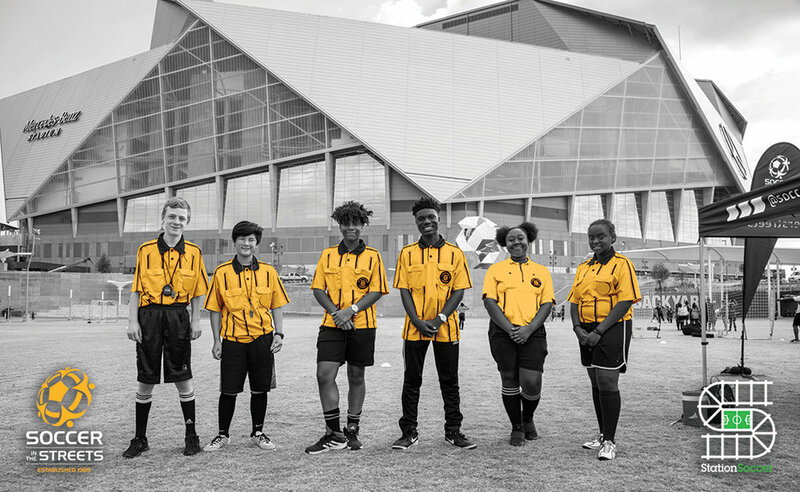 But officiating offers a way to bridge the gap for young people from under-resourced and under-represented communities, to have access to the entry-level jobs that are afforded through soccer. Leading the newly certified referees, Project Owner, Jill Robbins. She has witnessed first hand the growth of each individual. The program was her brainchild. And, she believes this program has influenced these players in an impactful way. It has introduced these bright, resourceful and mentally tough young people to the job market as well as the ranks of new officials. And, what makes it interesting is that they receive the training, skills, and resources to succeed. Goal 1: Increase the pool for potential referees in underserved communities and better prepare them for joining the ranks of soccer officials. Goal 2: Provide an entry point through which candidates will be recruited, screened, trained and certified to officiate youth games and move candidates through that process. Goal 3: Provide the support needed to retain referees once they enter the ranks of soccer officials. Though it all sounds good, there are other barriers that don’t let teenagers officiate. The main barrier for many aspiring officials is that initial cost - from uniforms, whistles, flags, wallet, watches, and the certification program itself. That startup cost is over $200 and for some kids, that is a barrier that keeps them away. Soccer in the Streets is eliminating that barrier. The program provides kits for the referees, with all of the needed tools and a bag, and the program also covers the fee for the U.S. Soccer Grade 9 course. There is another benefit to the program. These young officials become role models and influence their peers as well as the younger players to join. And, they see them out working matches and jamborees. Clarkston Refugee, Elvis Niyokwizera, is newly certified referee and excelled exponentially in the Referee Program. Once you have your certification, then you have to get games assigned specifically. So, Robbins introduced the Clarkston FC newly certified referees to the head DDY referee assignor, John Hermann, who is now utilizing some of these new officials to work matches. So, keep your eyes on the sidelines and you just might see one of the newly minted officials working a match.